Most people do not give much thought to the Earth’s magnetic field, yet it is every bit as essential to life as air, water and sunlight. The magnetic field provides an invisible, but crucial, barrier that protects Earth from the sun’s magnetic field, which drives a stream of charged particles known as the solar wind outward from the sun’s outer layers. The interaction between these two magnetic fields can cause explosive storms in the space near Earth, which can knock out satellites and cause problems here on Earth’s surface, despite the protection offered by Earth’s magnetic field. A new study co-authored by University of Maryland physicists provides the first major results of NASA’s Magnetospheric Multiscale (MMS) mission, including an unprecedented look at the interaction between the magnetic fields of Earth and the sun. The paper describes the first direct and detailed observation of a phenomenon known as magnetic reconnection, which occurs when two opposing magnetic field lines break and reconnect with each other, releasing massive amounts of energy. The discovery is a major milestone in understanding magnetism and space weather. The research paper appears in the May 13, 2016, issue of the journal Science. Evidence suggests that reconnection is a major driving force behind events such as solar flares, coronal mass ejections, magnetic storms, and the auroras observed at both the North and South poles of Earth. Although researchers have tried to study reconnection in the lab and in space for nearly half a century, the MMS mission is the first to directly observe how reconnection happens. The MMS mission provided more precise observations than ever before. Flying in a pyramid formation at the edge of Earth’s magnetic field with as little as 10 kilometers’ distance between four identical spacecraft, MMS images electrons within the pyramid once every 30 milliseconds. In contrast, MMS’ predecessor, the European Space Agency and NASA’s Cluster II mission, takes measurements once every three seconds—enough time for MMS to make 100 measurements. Simply observing reconnection in detail is an important milestone. But a major goal of the MMS mission is to determine how magnetic field lines briefly break, enabling reconnection and energy release to happen. Measuring the behavior of electrons in a reconnection event will enable a more accurate description of how reconnection works; in particular, whether it occurs in a neat and orderly process, or in a turbulent, stormlike swirl of energy and particles. A clearer picture of the physics of reconnection will also bring us one step closer to understanding space weather—including whether solar flares and magnetic storms follow any sort of predictable pattern like weather here on Earth. Reconnection can also help scientists understand other, more energetic astrophysical phenomena such as magnetars, which are neutron stars with an unusually strong magnetic field. “Understanding reconnection is relevant to a whole range of scientific questions in solar physics and astrophysics,” said Marc Swisdak, an associate research scientist in UMD’s Institute for Research in Electronics and Applied Physics. Swisdak is not a co-author on the Science paper, but he is actively collaborating with Drake and others on subsequent analyses of the MMS data. 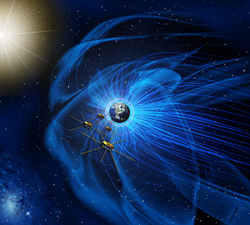 To date, MMS has focused only on the sun-facing side of Earth’s magnetic field. In the future, the mission is slated to fly to the opposite side to investigate the teardrop-shaped tail of the magnetic field that faces away from the sun. The research paper, “Electron-Scale Measurements of Magnetic Reconnection in Space,” James Burch et al., was published in the journal Science on May 13, 2016. In addition to Drake, UMD co-authors include Li-Jen Chen, associate research scientist in astronomy, and Shan Wang, postdoctoral associate in astronomy. This work was supported by NASA (Award No. NNG04EB99C). The content of this article does not necessarily reflect the views of this organization.